ItemI-52515 - "Map of BC showing location of water power sites, both developed and undeveloped". ItemI-52520 - "Steeple Rock on the west shore of Chilko Lake; Coast Range in the distance; Chilko Lake nearly 70 miles in area, 40 miles long and very beautiful". ItemI-52521 - "Tiedemann Mountain and broken ice at the foot of Tiedemann Glacier; Mystery Mountain or Mount Waddington is seen in the distance". ItemI-52522 - "Ootsa Lake, central interior of BC." 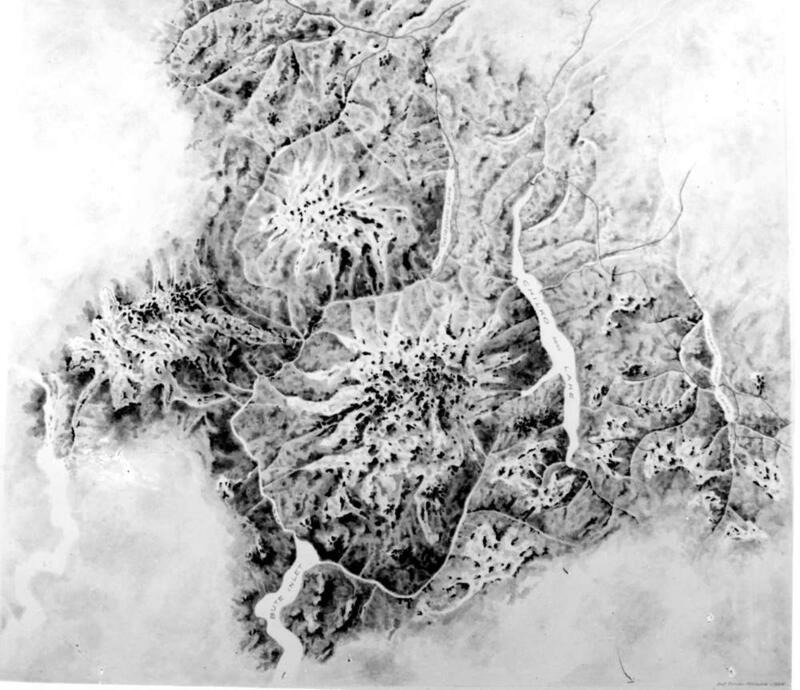 ItemI-52523 - "Relief map made from the engineers notes by the Geographical Branch, of the Taseko-Chilko-Homathko project, or country covered by the project, or suggested development"
ItemI-52509 - "Sarita River Falls near the Alberni Canal, Vancouver Island". ItemI-52510 - "Nieumiamus River Falls on the Nieumiamus River, North Bentinck Arm near Bella Coola". ItemI-52272 - "Evans tobacco", No. 49. ItemI-52273 - "Tomatoes; cannery", No. 6. Item I-52523 - "Relief map made from the engineers notes by the Geographical Branch, of the Taseko-Chilko-Homathko project, or country covered by the project, or suggested development"